Computational Modeling involves using computational power and simplified models to gain insight into complex systems. These tools are being applied across and between disciplines to address problems in areas like environmental chemistry, social networking, and epidemiology. Spatial Analysis and Modeling - Visualization has always been a strong part of the scientific enterprise. New computational tools like GIS and three dimensional imagery are allowing us to see and understand data in multiple dimensions at once. We are using these tools for research and integrating them into classes at Carleton. Environmental Science at Carleton is strongly tied to our Program in Environmental & Technology Studies (ENTS), which includes faculty in Economics, History, Political Science and other departments as well as scientists from the Biology, Chemistry, Geology and Physics departments. 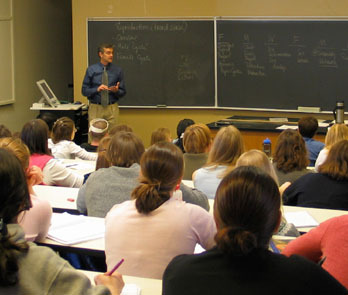 Neuroscience at Carleton involves faculty in the departments of Biology and Psychology. Students can earn a concentration in Neuroscience, which includes a capstone course that takes advantage of collaborations with other local institutions. Research on Learning - A more evidence-based approach to assessing student learning is key to improving teaching. Several Carleton faculty are engaged in scholarly projects related to student learning in their courses. Bioinformatics - Accessing, manipulating and visualizing vast quantities of information is becoming a crucial part of biology. At Carleton, bioinformatics tools are integrated into and across our Biology curriculum, beginning in the introductory courses. Intradisciplinary Biology - A portion of Carleton's HHMI grant is dedicated to supporting intradisciplinary projects within Biology. This need grows from the huge range of systems studied in Biology, from molecules to cells to organisms to ecosystems. Literature and Resources - We have complied resources here to support interdisciplinary and integrative teaching activities, with a focus on science and math fields. Browse through Teaching Activities and Course Descriptions submitted by Carleton faculty who have undertaken curriculum development efforts with support from CISMI.